Voting will take place from 07:00 to 22:00 BST on 4 May. 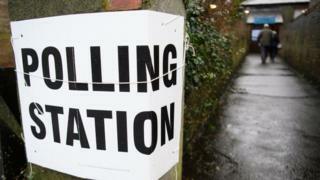 Elections will be held in 34 councils in England, all 32 councils in Scotland and all 22 councils in Wales. In addition, six areas in England are voting for newly-created "combined local authority mayors". These mayors will mostly be responsible for economic development in their regions, but some will have powers over transport and housing. Doncaster and North Tyneside are also voting for local authority mayors, who are elected leaders of their respective councils. The Manchester Gorton parliamentary by-election triggered by the death of Labour MP Gerald Kaufman was also due to take place, but has now been delayed until the general election on 8 June. A total of 4,851 council seats are up for grabs across England, Wales and Scotland. These figures are estimates because there have been boundary changes since they were last contested. There are also 687 independent councillors, with no party allegiances, whose seats are being contested. The rest of the total is made up of residents' association councillors and parties with a handful of representatives, including Cornish separatists Mebyon Kernow, who have four councillors. When are we expecting the results? Some English and Welsh councils will begin counting ballots as soon as polls close at 22:00 BST. Others will start counting on Friday morning, with results continuing all day Friday. Scotland's 32 councils will start their counts on Friday morning, with first results expected from midday. Most mayoral results will be declared on Friday. Where can I watch the results? There will be full live text and video coverage of the results as they come in on the BBC News website and on special BBC news programmes. You must be registered to vote, be at least 18 on polling day in England and Wales or 16 in Scotland, be resident in Britain and be British or a Commonwealth or a European Union citizen. To take part in the polls, voters had to be registered by midnight on Thursday, 13 April if living in England or Wales, and by Monday, 17 April if living in Scotland. It's too late to register for Thursday's local elections, but voters have until 22 May to take part in the general election on 8 June. For more information click here. Convicted prisoners, anybody found guilty of election corruption within the past five years. Members of the House of Lords and anyone subject to any legal incapacity to vote. If you are registered to vote you should have received a polling card telling you where you should go to cast your vote on Thursday. You do not have to take the card with you when you go to vote. No form of identity is required. If your polling card hasn't arrived, contact the electoral services department at your local council. The deadline for asking for a postal vote from the electoral registration office at your local council has passed. If you have applied to vote by post, you cannot vote in person at the polling station. However, you can return your postal vote to the polling station before 22:00 BST, or to the returning officer at your local council before they close if you do not want to post it or it is too late to post it. See the Electoral Commission's guidelines for postal voting. You can only apply for a long-term proxy vote if you have a specific reason such as a disability or being overseas. To vote by proxy for just one election, you must have a reason - for example you will be on holiday or away owing to work. The deadline to vote by proxy has already passed, but if you are suddenly incapacitated or taken ill, you can apply to vote by proxy for medical reasons up until 17:00 BST on polling day. I'm away from home at university on 4 May, where do I vote? As long as you are registered to vote in both places you can choose to vote at either your home address or your student address - or in both places if they are in different council areas. To help blind and partially sighted voters, there has to be a "tactile device" in each polling station and there are rules on the size of print on ballot papers. The vast majority of polling stations are now more accessible for wheelchair users. Proxy ballots are allowed for those unable to vote because of disability. A doctor's note is required if the person with disabilities is applying for an indefinite proxy vote. What happens if a voter is illiterate? There is no literacy qualification for voting: anyone who cannot read or write can ask the polling officer at the polling station to mark their ballot, or have the candidates names read out, or take a companion to help them. No. People cannot be forced to vote and registration is not compulsory. Why don't I have a vote this year? Not all councils hold elections at the same time. All councillors are elected for a term of four years, but the four-year cycle of elections is different for different councils. This year it is the turn of all the English county councils, who last had elections in 2013, and seven other authorities. Next year will see elections to all the London boroughs and some of the smaller district councils. There are also some councils who elect a third of councillors each year for three out of the four-year cycle. Six new mayors are being elected to represent several regions of England. These mayors are being created as part of the government's drive to devolve more power to English regions. The mayors will serve and represent a number of local authorities in each region. Their exact powers vary according to the different agreements reached between local authorities and the government, but will mainly cover economic strategy, transport and planning. Local authority mayors are also being elected in Doncaster and North Tyneside. Mayors are elected using the Supplementary Vote system, which means voters choose first and second preferences for mayor. Candidates must be aged 18 or over and either be British or citizens of other European Union or Commonwealth countries. In addition, those standing in English council elections must be on the electoral register of the council concerned or must have lived in or worked in the council area within the past year. Those banned from standing in the elections include anyone employed by the local authority, bankrupts and people in a variety of politically restricted jobs. The deadline has passed to register as a candidate for these elections. All political parties have to be registered with the Electoral Commission if they want their names to appear on the ballot papers. The commission will need the names of three party officials and details of the party's financial structure. It can refuse to register a party if its name is confusingly similar to another party's or if the name is deemed offensive. The deadline has passed to register a political party for these elections. The top official of the local authority is the returning officer for the elections in each constituency, with the day-to-day running of the poll left to the head of the council's electoral registration office. They do not have to be - it is just convention. One theory about its origins is that people were not paid until Fridays and so holding polls on Thursdays ensured they were not too drunk to vote. The Electoral Commission has recommended trials of weekend voting to boost turnout. Every part of the corporation has to follow election guidelines published by the BBC They included advice on "appropriate" level of coverage to give to each of the political parties.